Is there a gentle eco-friendly shampoo and conditioner that smells good and delivers what it promises? See what we say. A balanced cleansing and conditioning system can be as elusive as a winning lotto ticket. In the sea of haircare offerings, can you really put your trust into one brand that can do the job on a daily basis? 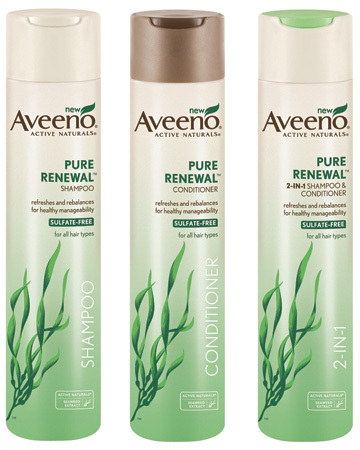 Aveeno’s new Pure Renewal haircare collection comes with an individual shampoo, conditioner and surprisingly a 2 in 1 (retro is the new black). Featuring sulfate-free cleansers that are paraben- and synthetic dye-free, the Pure Renewal collection has seaweed extracts that help provide a healthy dose of moisture and shine. The formulation also features a proprietary NatraSurf Technology that is naturally derived from potato starch; this helps give the shampoo a natural lather, even though the products are sulfate-free. The question is — do they work for everyone, and every day at that? We put Pure Renewal to the test to see if the brand’s claim — that the shampoo/conditioner are scientifically proven to make hair 80 percent more manageable after the first use and up to seven times healthier — held water. While I don’t have a way to tell if my hair ended up “seven times” healthier, I can definitely tell if it became more or less unruly than previously. 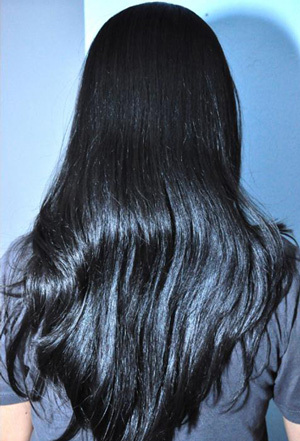 Pure Renewal also claims you’ll get softer, shinier hair. The naturally derived ingredients in Aveeno Pure Renewal shampoo made my hair feel very clean; for a sulfate-free product, it lathered beautifully. The conditioner was deliciously light with a mother of pearl quality to it: not quite a gel but not a cream either. 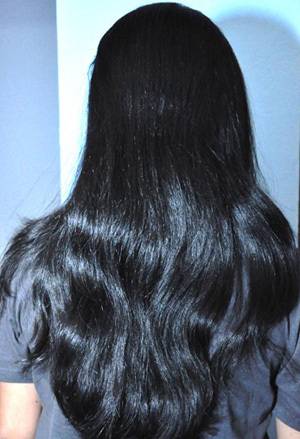 It made my hair feel silky even with one use and left it shiny. As for the manageability, I would say it improved because my hair lent itself better to everyday styling tools — including the flat iron. The 2 in 1 shampoo and conditioner is an interesting choice, and one perfect for that in between day when your hair just doesn’t need that extra separate conditioner. Each bottle retails for around $7 at mass merchandisers and hit shelves in February. If your hair has been soul searching for a gentle, daily wash, Pure Renewal may be just the ticket.